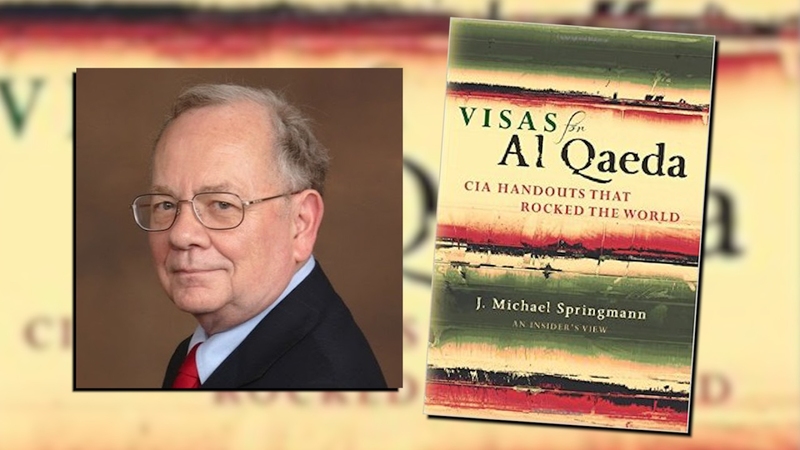 J. Michael “Mike” Springmann, author of Visas for al-Qaeda, attended the New Horizons Conference in Mashhad, Iran, last May. In this interview Mike and I discuss our experiences at New Horizons Conferences—and the witch hunt against New Horizons and Monica Witt, a former US Air Force officer who attended one of the conferences and who is now being charged with espionage. Immediately after recording this interview, I spent considerable time on the phone with a New York Times journalist describing my (very positive) impression of Monica Witt…and my sense that Bolton and Pompeo are lashing out against innocent people to distract from the failure of their Iran policy, and to punish New Horizons for spearheading an ultimately unsuccessful attempt to persuade the Iranian government to bring 9/11 truth into a US courtroom. This show was broadcast on February 14, 2019. This entry was posted on Wednesday, February 13th, 2019 at 10:24 pm	and is filed under Anti-War, Censorship-Propaganda, Education, False Flag/Fake Terror, Freedom, Kevin Barrett, News. You can follow any responses to this entry through the RSS 2.0 feed.